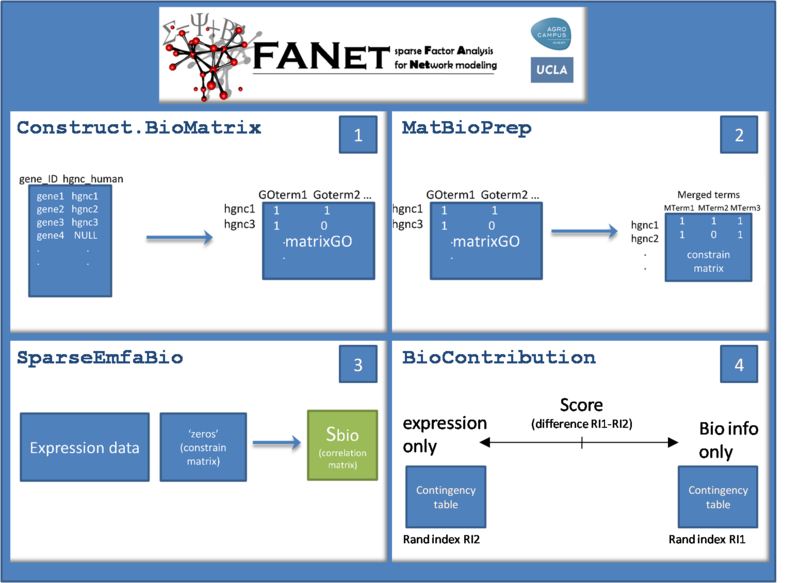 The R package FANet provides a powerful method for estimating high dimensional co-expression networks. Extending the idea introduced for differential analysis by Friguet et al 2009 and Blum et al 2010, we suggest to take advantage of a low-dimensional latent linear structure of dependence to improve the stability of correlation estimations. We propose an EM algorithm to fit a sparse factor model for correlations and demonstrate how it helps extracting modules of genes and more generally improves the gene clustering performance. Two main functions are available in FANet package in order to introduce sparsity in the network estimation. One function is based on a LASSO estimation using a cyclic coordinate descent algorithm. As an alternative, the second function is based on biological knowledge integration as Gene Ontology annotation. Finally, FANet results can serve as an input for WGCNA (Horvath et al 2008) procedure for gene module detection.